Item 057 - C.P.R. Station, North Bay, Ontario, Canada--65. 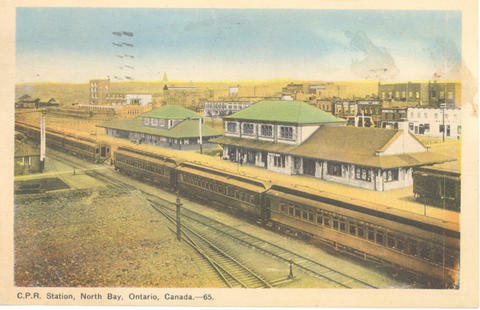 Card was cancelled at North Bay, Ontario, 7 May 1946. Card is addressed to: Master Harold Marble. 400 East Main St. Batavia, N.Y. U.S.A. Message reads: Dear Jackie!-- Hear is a train and I hope that I can bring you back a big fish. Grandad.